2D shoot 'em ups aren't as in vogue as they once were, having mostly been replaced by games where you roam around dim 3D corridors before getting shot. But in recent years, simple shooty thrills have found a new lease of life on handheld consoles, and with gamers yearning for old-school twitch-based arcade excitement. Gaming veterans will happily reel off lists of classic games of this type, until you force them to stop (possibly by swinging a 1980s joystick in front of their eyes, thus hypnotising them), but the genre really started with Space Invaders – that's the important one. And like all true classics, Space Invaders is still fun to play today, with the act of defeating the hordes of aliens using just your lonely ship still feeling heroic. (One might also argue that the game showcases some seriously poor army funding on the part of both humans and aliens. On iOS, an authentic Space Invaders experience comes by way of Taito's SPACE INVADERS (£2.99, iPhone, £2.99 iPad). Having separate versions both priced at £2.99 seems slightly ambitious to us, and we've gripes about each: the iPhone version lacks Retina display artwork for its interface (although the game graphics are pin-sharp), and the iPad version appears to be a zoomed iPhone game, so the controls aren't optimised. Still, it's genuine Space Invaders on iOS, and the developer even included options for tweaking the screen to resemble arcade versions. In the arcades, Space Invaders evolved over subsequent years. Super Space Invaders in 1991 included bosses and alarming cow theft by UFOs; Space Invaders '95 turned the emotionless space squids into oddball cartoon characters; and, more recently, homes were invaded in Space Invaders Extreme, a blisteringly fast, thoroughly exciting incarnation of the game, which we hope will one day arrive on iOS. The App Store only has one extra game with the Space Invaders brand, but it's fantastic. Space Invaders Infinity Gene (£2.99, Universal) begins life as the original game, but then propels you through the evolution of a genre, blasting your eyes with beautiful and iconic old-school visuals. It's an essential arcade blaster, albeit one that rather rapidly strays from its roots. So, if you're more into the classic Space Invaders game than newer incarnations, a good starting point is invaderR (Free, iPhone). The polar opposite of Infinity Gene, it somehow manages to simplify Space Invaders. The aliens no longer descend, although they and you are now armed with rapid-fire weapons. With just one life, the game is a great survival shooter that deserves a place on any device. In a similar vein, albeit with more variety, Parsec (Free, Universal) dares you to blast through 20 levels of somewhat Space Invaders-style action. Along with varied formations of glowing neon foes, you get bosses, power-ups and an asteroid field to pick through. 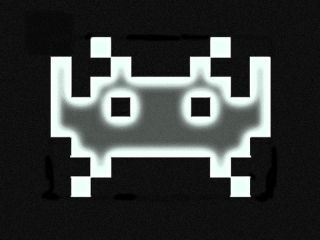 Elsewhere, Super Crossfire HD (£1.99, Universal), Velocispider (£1.49, Universal) and Space Inversion 2 (69p, iPhone; £1.49, iPad) also modernise the basic Space Invaders approach. Super Crossfire HD offers beautiful graphics, weapon upgrades, a warp gimmick, and a tough Dark mode that matches Space Invaders Extreme in terms of savagery. Velocispider is less demanding, but nonetheless a challenge as you aim to survive waves of beautifully drawn pixellated enemies, which, in an amusing nod to the aliens in Space Invaders, are mostly aquatic in nature. Space Inversion 2 strays less from the original template, with its Classic mode matching Space Invaders quite closely. We're more interested in the game's Arcade mode, which speeds everything up and adds some bonus rounds where you obliterate asteroids and UFOs. And if the game's still not fast enough, a 69p IAP gets you the Mega Turbo mode, along with a bonus-only mode and extra visual themes. You may have noticed we earlier mentioned that Parsec and Space Inversion 2 both have asteroid rounds, which, suitably, pay homage to Atari's classic Asteroids game, where you blast space rocks in a desperate bid for survival. But a few games use a retro hammer to smash Space Invaders into other classic games. The most successful is the fantastic Space Out (69p, Universal), which, as its name might suggest, gives you a Breakout-style bat-and-ball to destroy aliens with, rather than a laser cannon. Power-ups add extra strategy, and the retro graphics and audio make the game feel like a once-lost and newly unearthed arcade classic from the early 1980s. From the same developer, Flick Rocket (69p, Universal) has you flicking missiles at aliens while simultaneously defending cities from destruction. Three very different rounds are on offer, one each inspired by Space Invaders, Centipede and Asteroids, and the city defence theme also bungs Missile Command into the mix. It's not as impressive as Space Out – the difficulty's a bit high, and the controls aren't tight enough – but it's nonetheless enjoyable. Perhaps the oddest mash-up, though, is Space Inversion Puzzle (69p, Universal) from the Space Inversion 2 guys. It mixes Space Invaders in with an encroaching block action-puzzler (think reverse Tetris); there are some complex rules and mechanics underneath the shooting you'll need to learn. Finally, we can't let a roundup of games for Space Invaders fans end before we mention Blue Defense: Second Wave! (£1.49, Universal). Of all the games mentioned in this round-up, Second Wave most feels like it was built for iOS devices, eschewing typical drag controls for, in the main, a massive planet cannon that sprays bullets into space by way of your device's accelerometer being tilted. You can also drag to split the bullet stream between multiple targets or double-tap to set up a semi-permanent line of fire – and you'll need it here. In 1978, invaders from space were meandering and sluggish, dropping the odd bomb. In Second Wave, they're massive planet-sized behemoths that churn out myriad kamikaze drones to dive-bomb a target world. Clearly, these guys have learned a thing or two over the past few years – here's hoping us human defenders have, too.